1. Build bicycle infrastructure that solves the mobility challenges facing everyone - from people driving and taking the bus to those walking and biking. Specifically, create a one-way parking protected bike lane on Baronne Street and a one-way parking protected bike lane on O’Keefe Street. Safety! - As the data shows for the Baronne Street segment of the demonstration, smart bicycle infrastructure improves safety for everyone. Across the demonstration, protected bikeways reduced incidents of vehicular speeding, thus improving safety. 2. Create a connected, comfortable system of bikeways allowing people on bikes to get where they’re going safely. Specifically, we recommend a focus on getting people easily and safely to job centers in the Central Business District and French Quarter. Bicycle ridership increased significantly on all corridors during the demonstration because there were safe, connected, protected bikeways. The drastic increase in bicycle traffic going towards Canal Street on the two-way protected bikeway on Baronne Street shows a dire need for a comfortable connection through the CBD that doesn’t leave bike riders, motorists or pedestrians navigating incomplete connections which force everyone into unsafe and confusing situations. 3. Use smart planning and careful construction to fill gaps in the current bikeway network, connect biking to transit, and reduce traffic congestion. Traffic congestion is a problem for 1-2 hours per day. The only way to reduce traffic congestion in the thriving New Orleans downtown at peak hours is to give people more options for getting around, including safe biking and walking and frequent transit. The Connect the Crescent demonstration is an example of smart planning that leads to specific problem identification and proposed solutions (see below). Improve community outreach and engagement tactics, especially for special cases like large apartment/condo buildings. 4. 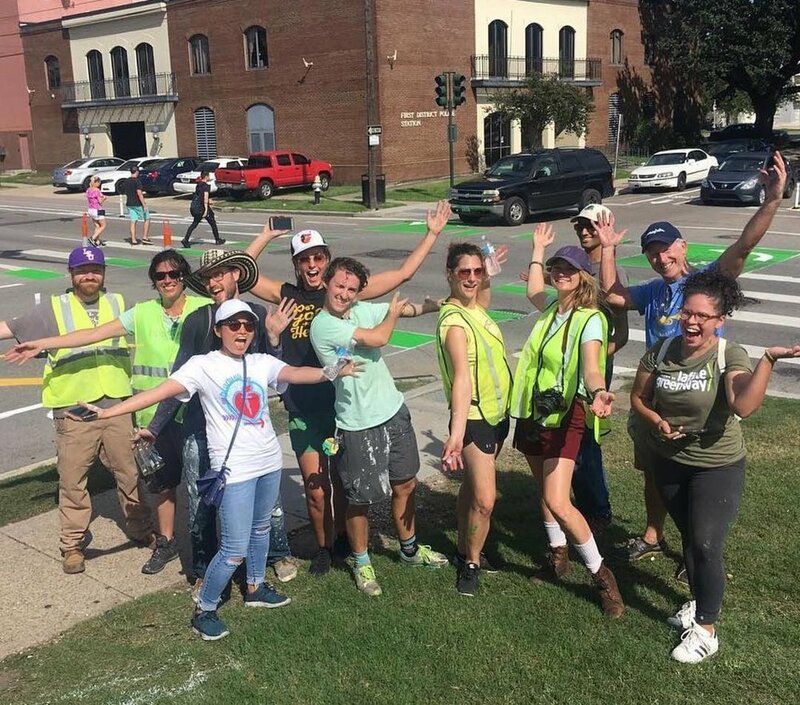 Update the New Orleans Complete Streets policy to ensure strong implementation that prioritizes equitable development of streets built to share; ensures diverse community engagement; and measures success of the Complete Streets Program along established metrics for improving equity, public health, economic development, and quality-of-life. Another important set of recommendations is around improving the demonstration process itself for the benefit of future efforts in New Orleans as well as for other communities. The bigger the project, the more cushion needed for installation. Being all outdoor work means schedules are tied to the weather and subject to slip (especially where it rain over 60” annually). Having a large event tied to the start of the project (Walk Bike Places Conference) was very motivating, but installation should have started sooner. The bigger the project the more information management needed. Set up solid systems for document and version control, scheduling and communications and other collaborative and shared materials. Leverage private partners, particularly manufacturers and construction firms. Starting with traditional local and national supports of active transportation, healthy communities and equitable outcomes; look to distributors and producers of materials and local roadway construction firms for materials, equipment and expertise. Ensure all roles needed for implementation are covered by project coalition. The steering committee for CtC was invaluable, but needed a greater role as an organizing or execution committee, particularly with limited capacity for staff time. Breaking up responsibilities into smaller pieces, would help spread the load more effectively and bring in more volunteer or donated time. Plan for maintenance. Even high quality construction tape needed touch ups, particularly if the surface was not sufficiently prepped. Paints can wear off quickly. Understand the limits of materials - they all have trade-offs - and plan accordingly. Ensure maximum activation with many smaller or simpler activities. While several larger events were planned, they require more time and energy. Simple “try-and-rides” partnering with the local bike share, Blue Bikes, cross-promoted both and are relatively easy to execute. Temporary nature was very effective in maintaining and building public trust, particularly for past issues. In situations where there is a trust deficit, ensuring a hard end to the project pays long term dividends on re-establishing credibility and reliability. Publish all materials for future use. For the benefit of future efforts, materials developed should be shared for any and all communities.